The Victorian-styled Menke House and the grounds of Festival Hill offer innumerable settings and beautiful backdrops for photographs of weddings and other events. Antique furniture, including full-length mirrors, exquisitely upholstered sofas and high-back chairs, and a variety of period ornaments and wall-hangings fill the parlors of the Menke House. The Herzstein Plaza, winding gravel walks and verdant arbors of the sprawling flower and herb gardens of Festival Hill are dotted with graceful fountains and charming Old World stone work. Amateur photography on the grounds is welcomed. It is best to check with our office to make sure other events are not scheduled. We encourage visitors to post photos of Festival Hill on Facebook and websites. 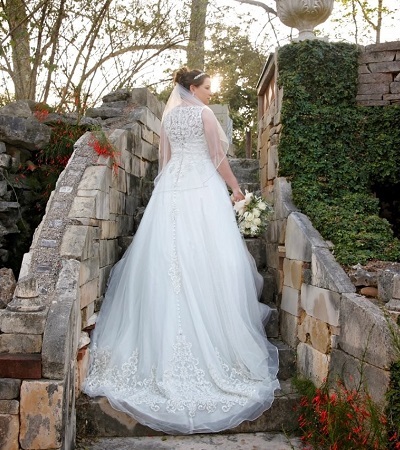 Professional outdoor two-hour photo sessions around the stone bridges, herb gardens and in front of the Chapel are $75, while indoor two-hour photo sessions inside the Menke House are $150. Four-hour photo sessions which include indoor access to the Menke House and outdoor settings are $200. All indoor shoots are available Monday through Friday only. Outdoor shoots are available on weekends with one of our preferred professional photographers only. All reservations include a complimentary dressing room with private bathroom. Submit the Online Request Form or call 979-249-3129 to reserve your next professional photo shoot. Payment in full is required to secure the date when your appointment is scheduled.